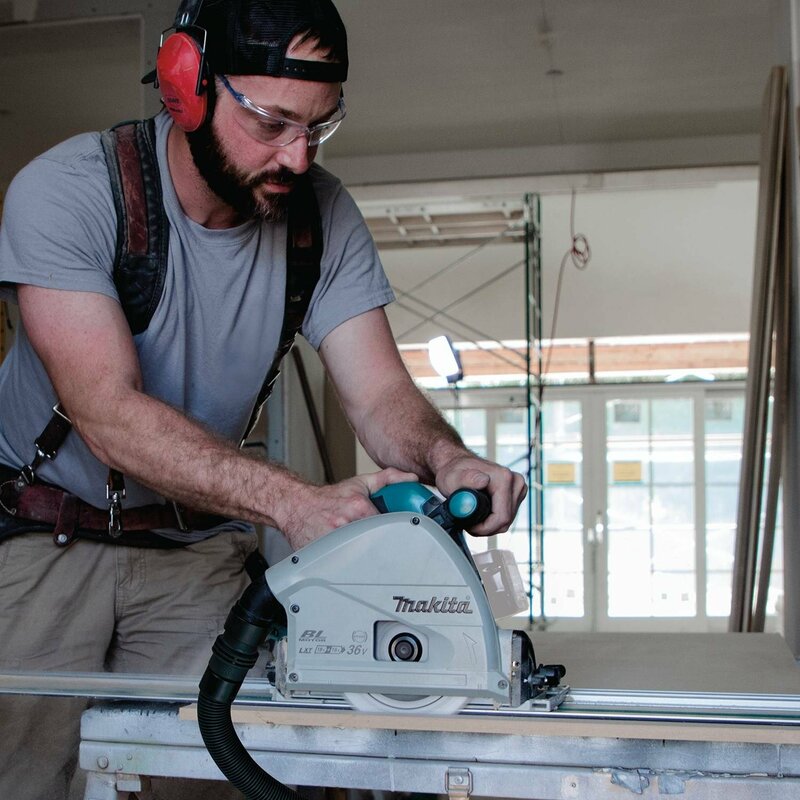 Do you want the accuracy of a $2,000 panel saw with the portability of a $300 table saw? The Track saw is ideal for quickly completing long cuts with high accuracy. Track saws offer one-of-a-kind cuts and a professional, smooth, splinter-free edge that is unmatched by circular and table saws, especially when cutting large plywood-based sheets. It was invented approximately 60 years after the table saw. Surprisingly, many craftsmen have never handled one, and it is still viewed with scepticism as a “new” tool. Here is Tool Tally with the details. The track saw looks like a circular saw with a track guidance system. 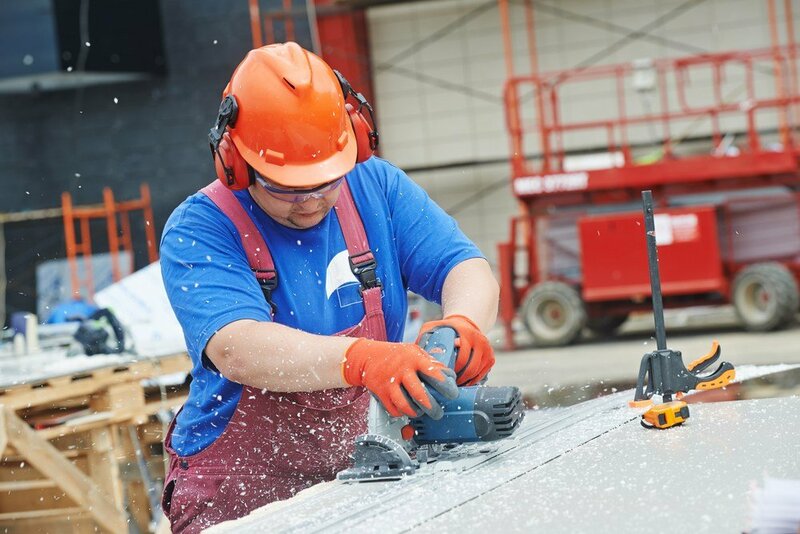 While you can retrofit a circular saw to the task, most contractors prefer to get the best results possible by using a dedicated plunge cut saw that is designed to work specifically with a plunge track system. The plunge saw allows the operator to simply release a lever and “plunge” the saw into the material, allowing for easy cuts in the middle of the board. The track saw takes up less room than a table saw and can perform cuts that table saws cannot. It is a versatile power tool that is ideal for cutting MDF, Plywood, and those challenging formica cuts that are susceptible to chipping. It is quickly gaining increased popularity among contractors looking to unlock faster, longer, cleaner, cuts. Here are the best track saws. The corded saw is used heavily by contractors and in the shop. These more robust motors make it easy to get a clean edge with out lagging, binding or burn marks on the wood. These are especially handy when working with hardwoods. 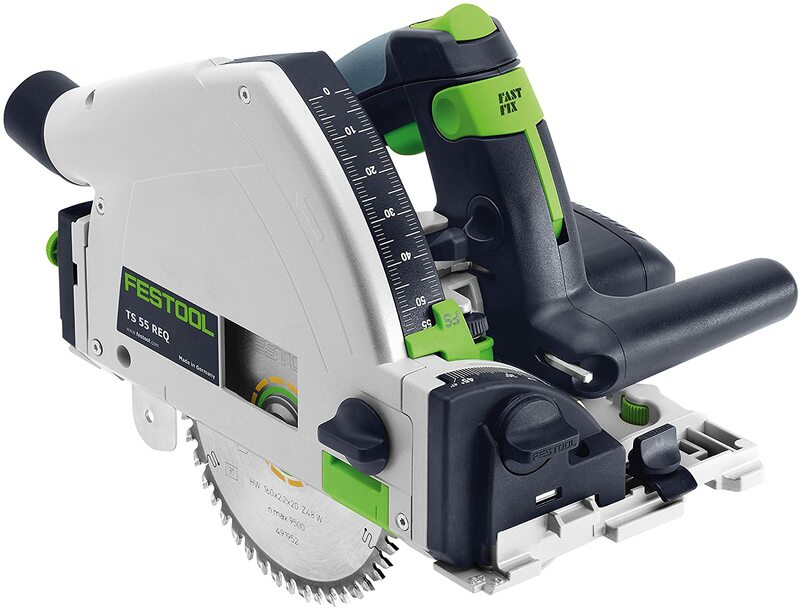 Festool has long been the king of track saws and has only found significant competition over the past several years. It is our premium pick and the only choice for the contractor who insists on having the best equipment. If you are doing a lot of Cabinet work or high-end flooring, you won’t go by wrong by investing in the saw with one of the best track records. 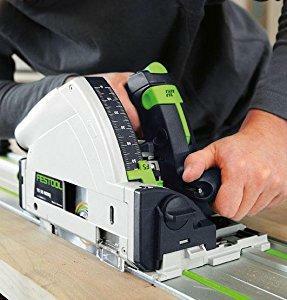 The Festool 75 has a bigger motor and offers a deeper cut than the festool TS 55 REQ track saw that has dominated the industry..
One of the unique features that sets the tool apart is it’s MMC electronic motor control. This motor uses a soft start to begin the cut and then speeds up slowly, offering the operator greater control and a cleaner cut. The track comes with a bright green sight line to give you greater accuracy and aim while working. The non-slip grips on the underside of the track are replaceable, and the splinter guard helps leave you with two smooth edges when you have completed the cut. As you would expect, the saw also has a variable speed wheel on the back of the motor housing. Turning it allows you to preset your no-load speed from 1350 to 3550, allowing you to adjust the tool to your task. To protect your investment, the saw comes with overload protection. If it gets overloaded, the blade stops spinning, and it also shuts down when overheated. Usually, it takes 3-5 minutes for the saw to cool off following a thermal shutoff. All of these saws use innovative systems to reduce the risk of kickback. On the Festool track saw, they add a heavy clutch that allows the blade to slip instead of kicking back. It also uses a spring-loaded riving knife (splitter) to keep the kerf open and avoid pinching the blade while you are completing your cut. Since the blade doesn’t get trapped between the lumber, there is very little risk of kickback. Without the guide rail, you have a cutting capacity of 75 millimeters or 2 and 15/16 inches. With the track system, the blade is limited to 2 and 3/4 inches in cutting depth, allowing for a slightly deeper cut than some of their competition. This is a great place to point out that Festool often uses millimeters for setting the depth gauge. It’s not a deal-breaker, but about the only annoyance with this tool for Americans. Make sure your tool is the “USA” version if you want imperial measurements. The Fast Fix blade change is probably the best in the industry. When you flip the big green lock forward, you are able to plunge the saw into a locked position for easy access to the blade. Most of the other tools require multiple tightening and locking to secure the arbor and switch blades. The Festool 75 Comes with the 75-inch rail system. You can buy additional lengths as needed. The dust collection system is one of the best as the shield offers complete coverage of the blade. Conclusion: While the other tools are very reliable, when accuracy and a high-quality finish is important, Festool is the best track saw to go with. Thin Track makes this saw nimble and easy to use. Riving knife and Clutch prevent kickback. 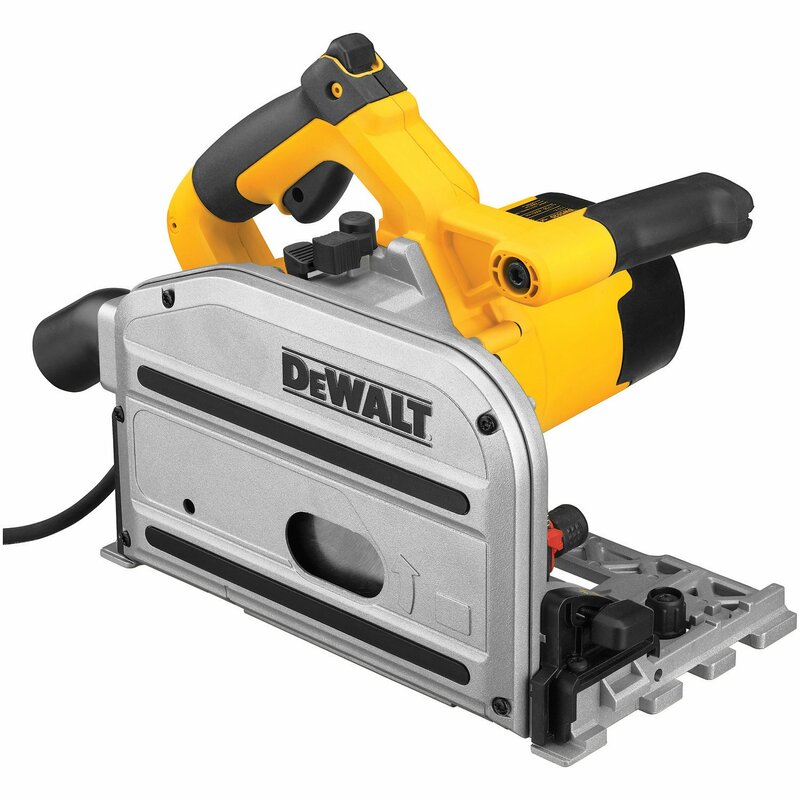 The Dewalt DWS520K is the top pick for most of our shoppers. They accurately duplicate most of the features of the Festool while controlling costs to offer an affordable, accurate workhorse of a tool. 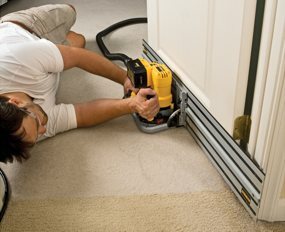 We’ll review the Dewalt Cordless Tracksaw kit below, but I wanted to start off with their higher amperage, corded one. This saw, along with the Makita, has proven to be one of the top challengers to the Festool product. At 12 amps, the Dewalt DWS520K is in the same classification as the Makita 6000J. For those of you wondering, that converts to about 1.74 horsepower for both the Dewalt and the Makita. For comparison, the Festool 75 runs at about 1.9 horsepower. The Dewalt brings innovations to the copycat plunge saw market. The saw’s plung mechanism has an additional pivot that makes you feel like you are pushing the saw forward instead of down. In reality, you are getting more of a direct downward plunge that you get with the other saws. It also has an additional kickback protection in the track. The track only allows forward saw movement and prevents the saw from moving backwards, providing an extra layer of kickback protection. The Dewalt also has a riving knife to keep the kerf open while you cut and prevent blade pinching. As with the competition, the Dewalt brings a variable speed option with RPMs from 1750 to 4000 RPM. 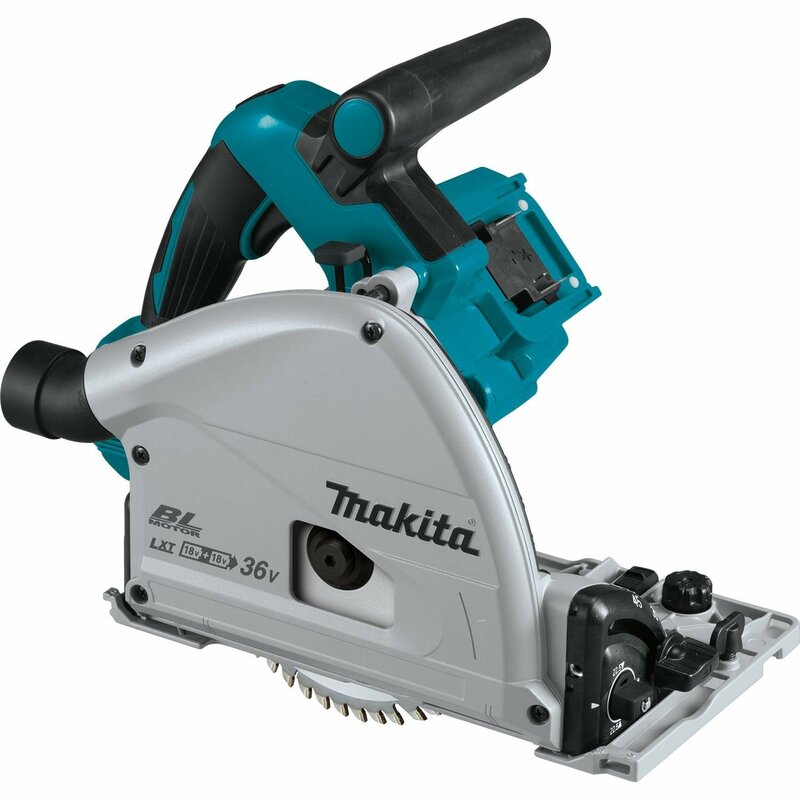 It offers a soft star motor, but seems to be a little louder than the Makita or Festool. As with the other two saws, there is a brake to stop the saw quickly after you release the trigger to prevent accidental cuts. This saw has zero clearance, so you just line the track up with your layout marks and begin cutting. If you are working next to a wall, you need at least 12 mm of clearance to run the saw. The one annoyance with this saw is that blade changing involves opening a lever, plunging the saw, tightening a screw to lock it into the plunged position, and securing the arbor bolt while you unscrew the saw blade. 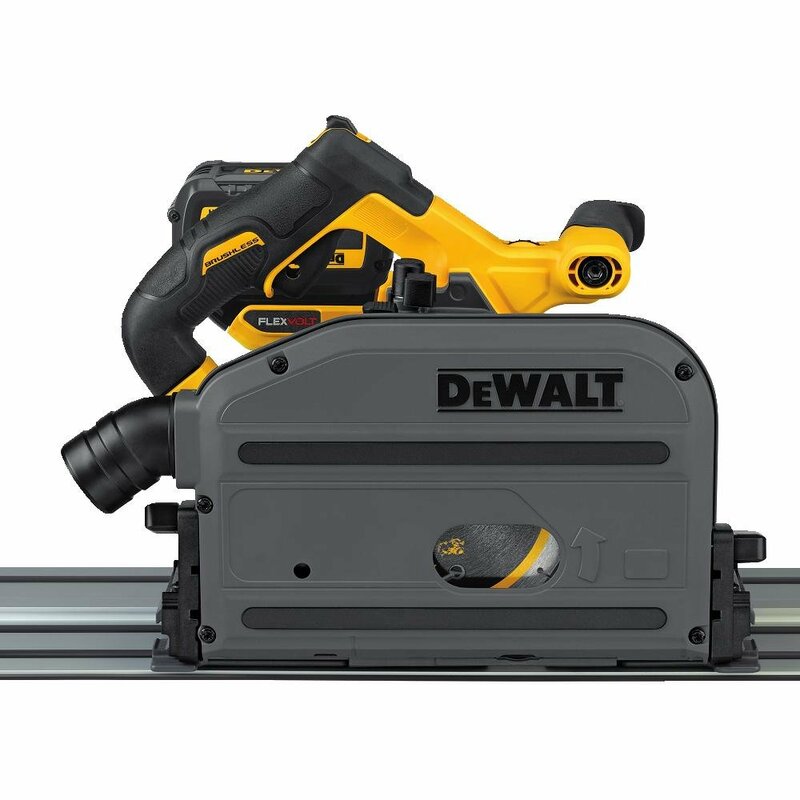 Conclusion: The Dewalt offers similar power and better kickback protection compared to the Festool, but for a fraction of the price. The Makita SP6000J offers a 12 amp motor, which puts it on the larger end of these tools, and capable of producing deeper cuts through luxury hardwoods without lagging or leaving rough edges. As with the Festool, the Makita SP6000J1 offers a soft start to prevent over-torquing on the take off. It also provides variable speeds from 2,000 to 5,200 RPM that is controlled by spinning a knob on the inside of the handle. One of the unique features of this tool are how it makes more accurate miter cuts. It has little discs that flip out to slip into groves on the track. These little discs “lock” the saw into the track, keeping it from flipping out of the track when performing miter cuts. Another nice piece is the “scoring stop”. This button stops the saw at a cut of 2 millimeters deep. This is the perfect depth to perform a scoring run of laminate or veneer where chipping is a concern. By scoring the piece on first pass, you can protect these finicky pieces of wood and get a perfect result every time. As with the Festool, you also get a one-movement lock of the plunge for changing blades. This makes it easy to get to the arbor, loosen it and slip a new blade in with minimal downtime. 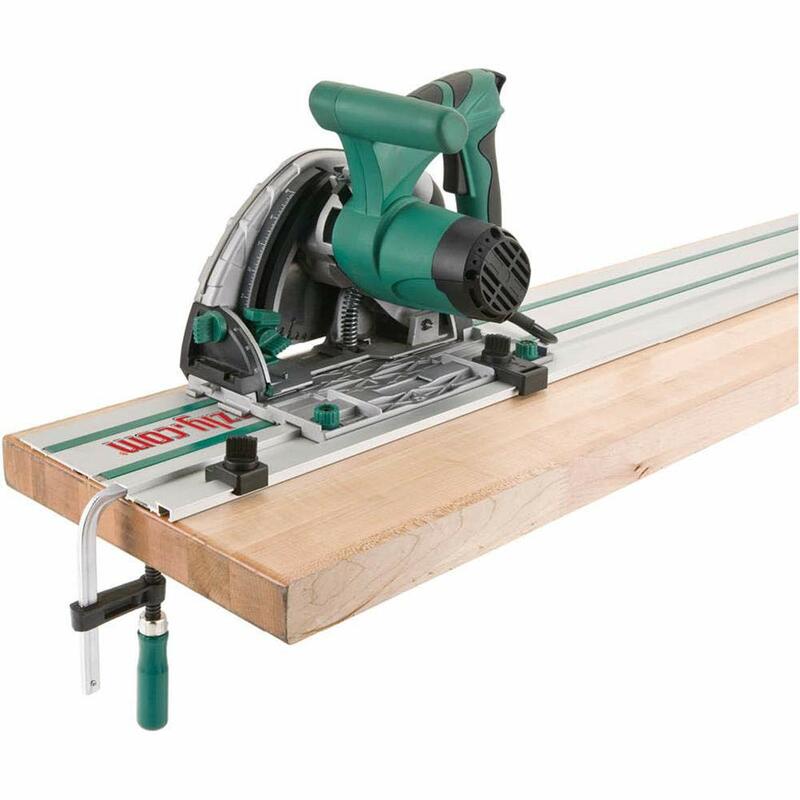 One of the unique features of this saw is that it can run on the Festool track. 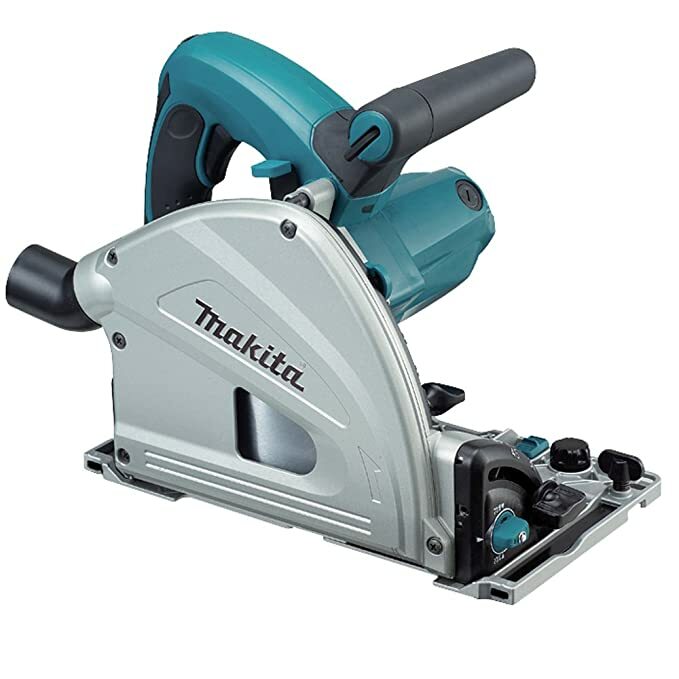 So if you are looking for a Festool replacement, this might be a great time to look at the Makita. The ability to use the Festool track answers one of the biggest complaints with this saw: guide inaccuracy. It takes a little more care to set up the tracks that come with this saw. The tracks are made from a slightly thinner metal and are more flexible. The rubber grips don’t seem to be quite as reliable as the Festool one. They’re good, but for those used to the Festool track will notice the difference. As with the Festool, you have the automatic braking to protect the saw should you overload it. The only thing that this saw is missing is the riving knife to prevent kickback. Conclusion: Kickback is a big deal for me, making the Dewalt that I reviewed above one of my personal favorites. Cut quality is on-par with all of the other top-tier saws. The 2 mm scoring feature makes it extremely valuable for those who work with cabinets, countertops and expensive woods. For our Festool fans who want to save some money, the TS 55 offers the advantages of the Festool brand while leaving some money for that new shop light you’ve been eyeing. One quick note is that Festool recently switched their tools to a “USA” version which offers depth measurement in inches. This is an incredible upgrade, however it created a new model number, and created some confusion among online reviewers. The 11 amp motor is running at a hair less power than the Dewalt with 1.6 horsepower. You’ll still have no issues moving at the full cutting depth of 55 millimeters (2 – 1/5 inches). It is also a variable speed tool with 2,000 to 5,200 RPMs available, just like on the Festool 75 TS. As with the bigger brother, the Festool offers a riving knife to prevent kickback. The device is also protected with a thermal detector to prevent overheating the motor. One of the differences between this saw and the TS 75 is the Pulse With Modulation variable speed control. Where the TS 75 uses electronic controls for the speed, the TS 55 uses gears, which creates a little bit of a “growl”. The Festool is also ideal for cutting soft plastics, brittle plastics, thin aluminum, and extruded aluminum. Conclusion: Most of our shoppers will likely appreciate the Dewalt brand name and go for that. But for the high-velocity cabinet shop that wants a tool with replaceable brushes and the ability to withstand non-stop use, the Festool deserves a closer look as a long-term investment. Smaller 11 amp motor is slower for users who work with a lot of thick material. I’m not sure where to put this saw. You’re getting the 12 amp motor which, sizewise, puts it in the same category with the Makita and Dewalt tools. However, you are also dealing with some quality assurance problems with build. It rides well in the track, but you need to use a square to make sure you are working on a true 90 degree angle before beginning any project. And you might want to double check your angles before cutting with it. I’d definitely go with the Makita before getting this one. I’d still get this one ahead of the Fox model as you have the heavier motor and the scribing line function that makes this saw suitable for working on laminate counter tops. The limited 12 month warranty should cover your worst-case scenarios, and it overall should deliver good cuts for you. However, just be aware that it may need alittle more setup time. The Fox has a lot of specs that make this the top pick for those of you who might not be ready to splurge on a plunge circular saw, but who have no qualms about buying a nice circular saw. The Fox is running with the smaller 9 amp motor that is common in circular saws. You’ll want to be careful when cutting thicker pieces of material, but this should be more than enough motor for standard plywood cuts. One of the key points to recognize before purchasing is that it is a 160 mm blade, not a 6.25 inch blade like almost every other saw on here. It also uses a 20 mm arbor, not a 5/8 inch one. Freud makes a blade that works very well with this saw. 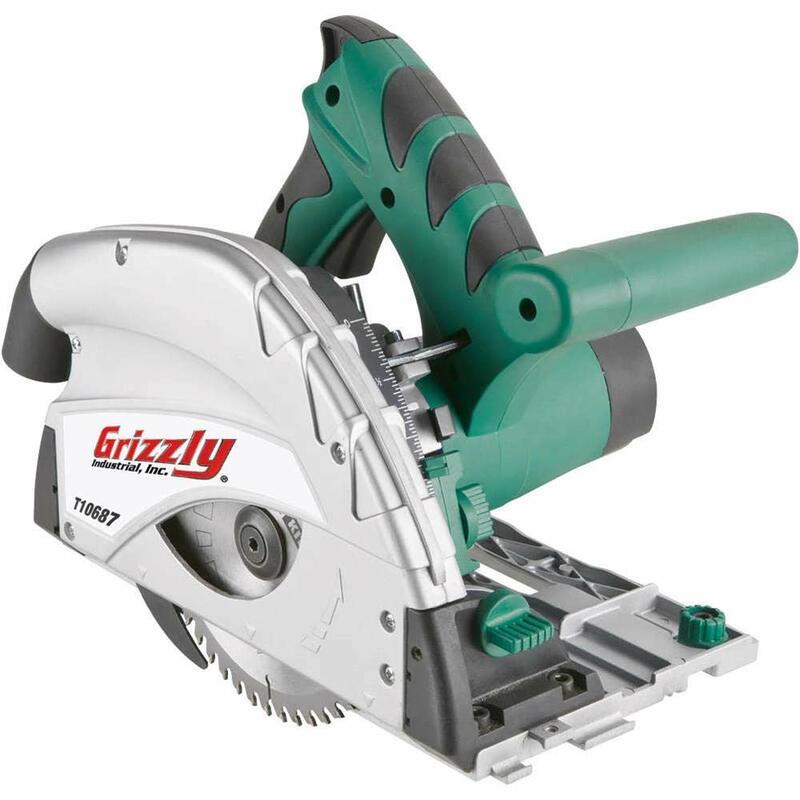 This saw looks so much like the Grizzly that they may well be made by the same manufacturer. However, while it lacks the track accuracy of the first 4 saws we reviewed, it doesn’t seem to generate the same amount of frustration as the Grizzly. Conclusion: Between the Grizzly reviewed below and this Fox, I’d go with the Fox. It is still more accurate than using a circular saw without a track. Having been to the home location of Grizzly tools a few times and a proud owner of some of their industrial products, I’m always excited to add this one to the list. You’ll notice right away that it is underpowered with a 9 amp motor. For our comparison purposes, that gives us about a 1.3 horsepower motor. If I could summarise this saw, it is a high-end circular saw with plunge cut features, dust collection and the ability to use it with a track for those moments when straight cuts matter. One of the biggest frustrations with this saw is that it isn’t the most accurate track saw. You get a lot of “slop” in the track, which gives you a less-smooth cut than what you get with the other saws. Unlike the other saws, there is not an easy way to fix this slop. The other downside with this saw is the lack of power. With only 9 amps of motor, kickback is inevitable, and you will have moments where you damage your board and your track. I would not choose this saw for things tricky materials like laminate or melamine. It is should be good for ripping 3/4 inch plywood and MDF, though. It has a max cutting depth of 2-5/32, but I would be hesitant to go that deep unless working with soft wood. Final complaint is that the dust tube seems to clog up frequently. Grizzley is a good brand, but they fall short on this saw. What’s better than a track saw? A Cordless track saw! Keep one of these in the back of your truck to quickly rip down boards or trim up edges on the job site. Both Dewalt and Makita make an excellent Cordless track saw that is very similar to their corded version. As with their cordless versions, the Dewalt gets my pick for offering a rivving knife and their anti-kickback feature (which can be turned on and off with their cordless model). Dewalt is going to the next level with their batteries. While other brands insist on sticking with their current battery layout, Dewalt has invented a newer, bigger, battery that is also backwards compatible. Cool, eh? This 60 V battery gives you more power and a longer run time when on the job site. If I was looking for a tool that I plan on mostly using in my garage, or as a replacement for a table saw, I’d go for the corded version. 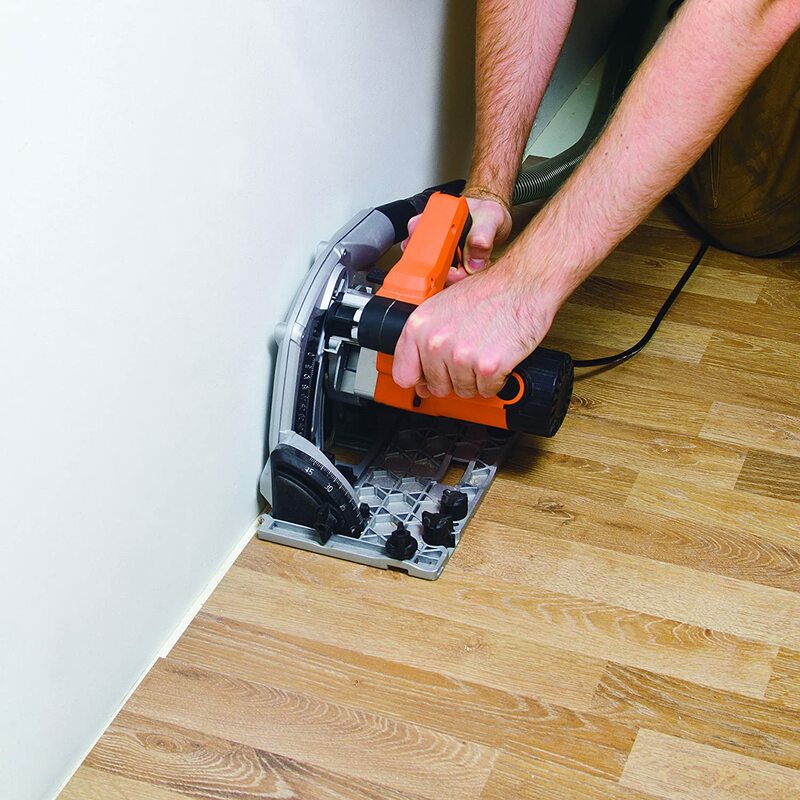 But for the contractor and remodeler who mostly works on a job site, the cordless version is an incredible option. Capable of cutting 2 and 1/8″ depth with a full-size 6.25 inch blade. I’d still be cautious about going slow enough to get a clean cut. You have the variable speed dial in the handle to control the speed. As a bonus, it is compatible with the Festool track. This track saw is analogous to the old story of the Russian’s taking a pencil into space while the Americans spent millions inventing a pen that could write in zero gravity. While Dewalt was creating a new, 60v battery that could power their high-torque tools, Makita was figuring out how to pair two batteries together to get a similar result. The Makita XPS01PTJ uses two of the standard Makita 18 volt battery packs (and yes, both need to be plugged in for this tool to work). 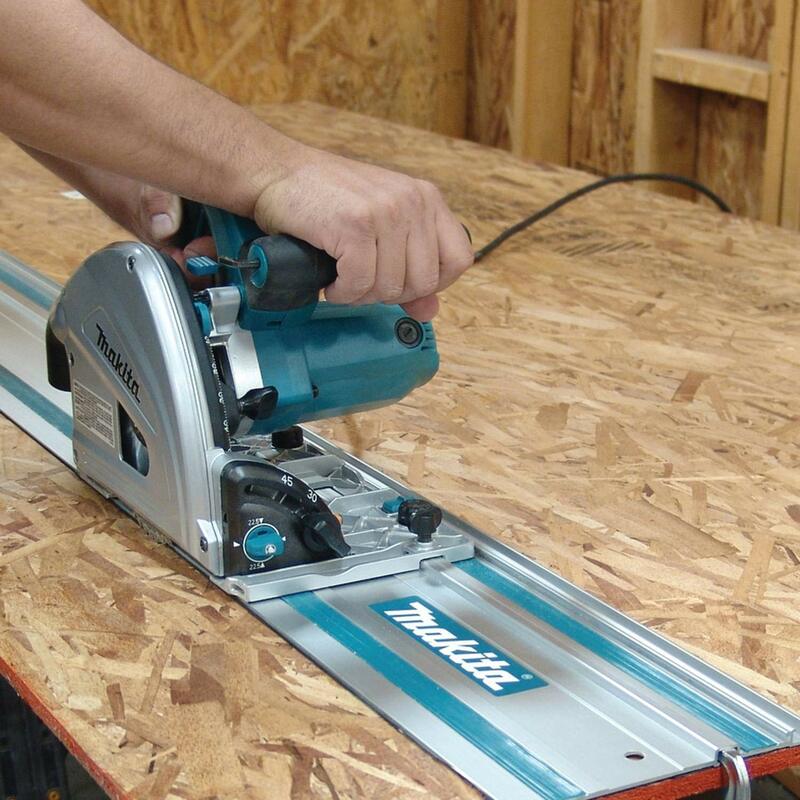 The Makita cordless tracksaw is almost identical to the corded one. You get the same range of bevel capacity(from -1 to 48 degrees). You also get the track lock to prevent tipping when cutting bevels and the handing scoring stop for those 2 millimeter scoring lines of high-quality woods and for laminate countertops. It also measures the depth cut measurements in millimeters. Two things that are highlighted on this new tool, that haven’t been a major point for the corded version are the automatic torque control and the close wall cutting. The user has some control over speed with the speed dial. However there is an added, internal, torque control that causes the saw to automatically switch between torque and speed cutting. When the tool senses that it is under a heavy load, the green torque light flashes and the blade slows to a higher torque mode. The other neat feature is that the tool can cut within 11/16 inches of a wall for those tight, finishing cuts. As with the corded version, there is no anti-kickback on this tool. The lack of kickback protection and the metric measurements are my two biggest complaints. What Do You Use A Track Saw For? At first glance, the Track saw looks similar to the circular saw. However, circular saws have never been particularly accurate. Circular saws are used for quick cuts where a certain margin of error is allowed. Circular saws are especially handy for cutting and ripping sheet goods such as plywoods and veneers. With a circular saw (and, to some extent, a table saw) there is a constant challenge with wandering cuts and burn marks. The track saw champions portability and accuracy. Lighter than a table-saw, the saw and tracks can be moved from project to project with ease. Similar to a circular saw, you are moving the saw across the material (As opposed to moving the material across the saw as you do with a table saw). However, the difference is that the saw rides in the grooves of a track system that prevents “wandering”. A good track saw also allows plunge cuts and creates a splinter-free cut line that allows the builder to move forward with more accuracy and fewer repeat cuts. 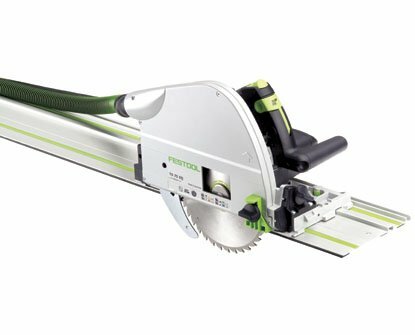 Two especially handy features of the track saw is the ability to make longer miter cuts and to be able to cut laminate countertops without chipping. Here is a quick overview of common questions before you begin shopping for a Track Saw. These tracks have a line-of-cut indicator. All you need to do is to lay the track so that it lines up with the layout markers you made on your board, making precise cuts a breeze, and speeding up your work. The tracks tend to have a little “stickiness” (rubber) to their underside so that they don’t slip on the board. Some folks will still clamp them to get the most accurate cuts, but, where accuracy can take a second place to speed, you can use the track without clamps. Drop the track, line it up, let it rip. The tracks are fairly good at mostly holding their position. This means that you can quickly set up the track and move from cut to cut without a lot of extra setup time. However, for added precision, track clamps come in handy. You can invest in the specific brand of clamp that is designed to go with your track. However, many of these are twist clamps that are annoying to set up. The best option is to get a one-hand clamp like this one made by Dewalt. This clamp universally works with any track system to allow you to quickly clamp them to boards of any thickness. The one hand operation makes it easy to use even by yourself on those Fridays when your shop intern is sleeping off a hangover on the pallets in the back. (Seriously, fire that kid already). Most of the kits come with a rail that is at least 50 inches long. However, diagonal cuts and longer boards typically require a longer piece of track. Sure, you could make two cuts, but that defeats the purpose of using the track saw. All of these tracks use extensions that clip together for a longer cut. The added rails are fairly affordable, lightweight and clip together easily. If you keep 96 inches of the track with you, it is rare that you will end up with any cut that is too long for you. It is virtually impossible to make cuts across on the diagonal of a sheet using a table saw. Most contractors use a circular saw for these triangular cuts and simply deal with the inaccuracies that come from that. By using a track saw, you can greatly enhance the accuracy and cleanliness of these longer cuts, getting a higher-quality product in less time. Angle cuts require a longer track, as you are cutting across the longer distance of the diagonal, so refer to our section above on track extensions. Because these saws operate within the footprint of your material you can easily make big cuts in a small space. If you have room for the sheet you are cutting, you have room for this saw to operate. You don’t need extra space to handle the infeeding or outfeeding space like you do with a table saw. They also make it easier for a solo operator to manage large pieces of wood. 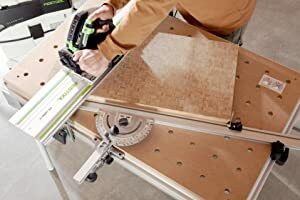 If you are looking to replace your table saw with a track saw, you will need to build a solid work table for supporting the wood while you cut. Their small size also means that they take up less space in the back of the workvan, allowing more room for things that matter, like lunch boxes. Plunge actions allow you to start and stop cuts in the middle of a workpiece. It’s a simple pivot that allows you to rotate the saw down into cut from above. You often see builders who imitate a plunge cut with a circular saw, by pulling the blade guard out of the way and forcing it down into the material. A plunge cut saw allows you to do this cut more accurately and safely. Kickback is always a scary part of working with power saws. There is no one who appreciates it when the blade uncontrollably jumps out of the cut. A spring-loaded riving knife is just like a splitter on a table saw. It rides behind the blade, keeping the right amount of pressure on the blade to prevent binding. Some saws have added features to keep the saw from moving backward on the track, offering even more protection against kickback. 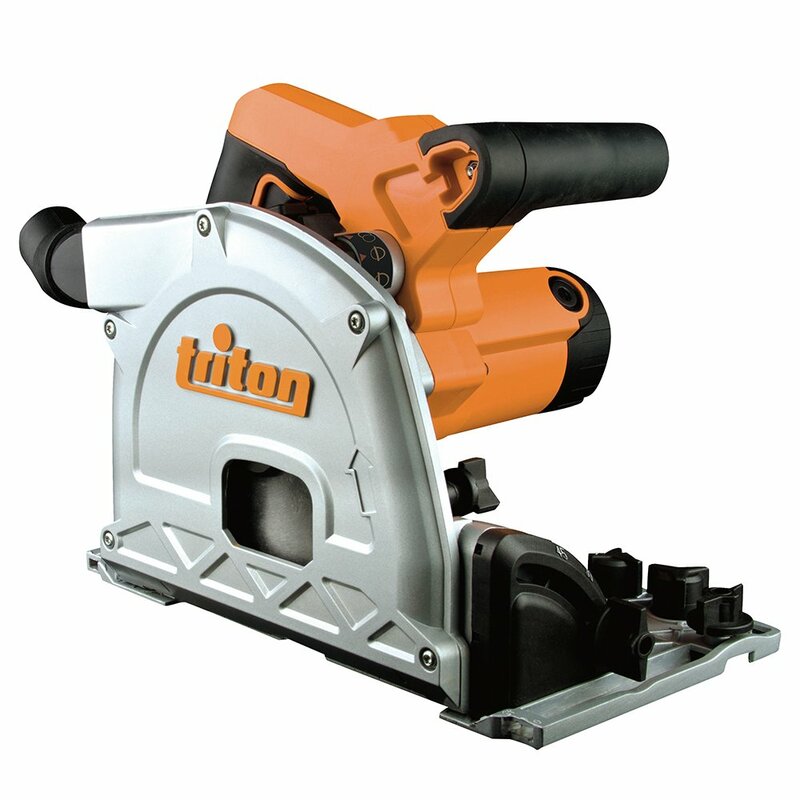 As a result, track saws typically deal with less kickback than table saws. As with a circular saw, all of these have a depth adjustment to ensure that you get the proper depth of cut without a lot of added bladed coming through the underside. The proper depth adjustment can help reduce flying dust, as well as providing a safer, cleaner, cut. This adjustment is easy to set. Most craftsmen only work with one or two depths, so it does not have to be fiddled with much. Keep in mind that sometimes the depth adjustment is in millimeters and sometimes they use inches. Conversion is always easy (25.4 millimeters per inch), but the proper marking notation may be a buying decision for you. A circular saw can be adjusted to cut at an angle or bevel. After you adjust the saw to the correct degree angle of bevel, you simply run the saw along the track like you would with any of the other cuts. The end result is a long, mitered cut. 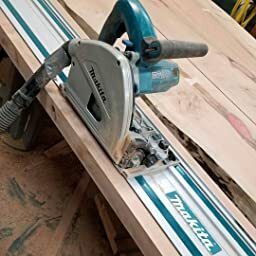 Where miter saws are usually limited to cuts of about 18 inches, the track saw can make much longer bevel cuts, adding a bevel to the entire length of the board, if needed. The blade is going to be cutting up from the bottom of the sheet material up towards the top. 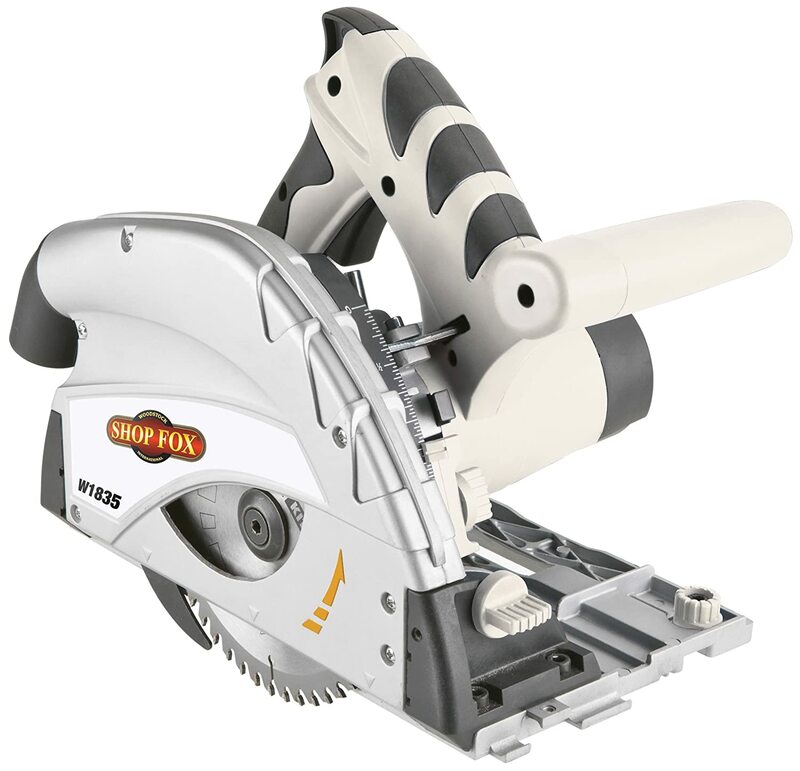 In order to prevent tear out and splinters, both the track and the saw itself will have typically have anti-chip devices built in on one or both sides of the cut to produce a smooth finish. Some of the devices are only going to offer the added finish protection on the inside (track side) of the blade. This isn’t typically a major concern, as these saws tend to produce clean cuts regardless. Dust is the biggest health hazard of working with wood. The fine particles enter the lungs and have been linked to a higher incidence of cancer. Most woodworkers become lackadaisical with lung protection. I’m so paranoid that I use a dust mask regardless of whether I am running a vacuum system. These tools offer dust collection that easily ports into your shop’s system. They use the standard 1 and 1/2 inch port, so compatibility is a breeze. Some of them also offer a small sawdust collection bag for reducing mess when you are working on a job site without a collector. The full coverage of blade shield helps capture more of the dust than a circular saw, creating one of the cleanest shop floors you’ve seen in a while — even when you are working with MDF. Can A Track Saw Replace A Table Saw? We go into this topic more in our discussion of Track Saws Vs Table Saws. Unless you are routinely cutting large sheets, it is likely that you will use a table saw more. I find that for cuts under 3 feet, I still prefer the table saw. On days when I need to do cuts over three feet, or when we are hustling and the guys are using the table saw heavily, I’ll run the track saw and save myself a lot of time. Also, as a quick note, these saws are only good for cuts of 2 inches of thickness or less.